An incredibly timely story celebrating tenacity and hope in the face of adversity, Saint Judy stars Michelle Monaghan (Mission: Impossible - Fallout) in a tender performance as a real-life immigration attorney who helped change US law to include women as a protected class. After having a vision of arms reaching through the bars of a cell pleading for help, Judy Wood decided to devote herself to immigration law to aid those in need. A single mother in her thirties, Wood started her own firm and, in one of her very first cases, found herself battling established law. Representing an Afghan immigrant who had been persecuted for opening a school for girls, Wood fought her way up to the Ninth Circuit Court and changed asylum law nationwide, finally allowing women to be included as a protected class. Saint Judy effectively recounts Wood’s story in this absorbing biopic, co-starring Alfred Molina, Alfre Woodard, Leem Lubany, and Common. 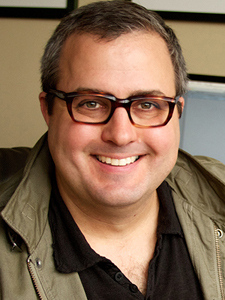 Sean Hanish is a WGA Award-nominated writer, producer, and director and a multi-award-winning commercial director. Sean focuses on creating realistic stories about everyday heroes with a positive social message. His previous films include Return to Zero (2014) and Sister Cities (2016). Saint Judy is his latest feature. A graduate of the University of Wisconsin, Hanish completed his Master of Arts at the University of Southern California School of Cinema-Television. He is a member of the Directors Guild of America, the Writers Guild of America, and the Producers Guild of America.